2018 Ukraine. Maxi Card - EUROPA CEPT "Bridges of Ukraine". Uzhgorod cancelled. Glossary: MNH - mint never hinged; MH - mint hinged; MNG - mint no gum; MLH - light traces of hinge; u - used; perf. - perforated; surch. Special cancellation - the city of LVIV. Also note that monitor settings may vary from computer to computer and may distort actual colors. Тhe set includes All photos are actual, so you buy what see on the photos. Ukraine 1918 Cover franked w/ complete Shahi set, cancelled "Volochisk"
Glossary: MNH - mint never hinged; MH - mint hinged; MNG - mint no gum; MLH - light traces of hinge; u - used; perf. - perforated; surch. Condition is as shown on photos. The set includes All photos are actual, so you buy what see on the photos. Also note that monitor settings may vary from computer to computer and may distort actual colors. The item should be in its original condition. 2018 Ukraine. FDC - EUROPA CEPT "Bridges of Ukraine". Kyiv cancelled. 2018 Ukraine. 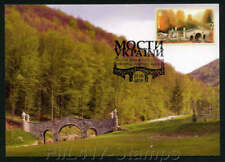 Maxi Card- EUROPA CEPT "Bridges of Ukraine". Terebovlya cancelled. 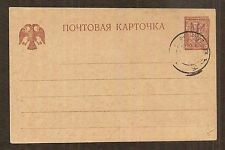 Ukraine 1919 Postcard franked w/ Kherson Trident Stamps, cancelled "Ovidiopol"
Special cancellation -100th Anniversary of Tauride National Vernadsky University. Also note that monitor settings may vary from computer to computer and may distort actual colors. The set includes All photos are actual, so you buy what see on the photos. Special cancellation -National Academy of Agrarian Sciences 100 years. The set includes Also note that monitor settings may vary from computer to computer and may distort actual colors. All photos are actual, so you buy what see on the photos. Ukraine 2018. Also note that monitor settings may vary from computer to computer and may distort actual colors. The set includes All photos are actual, so you buy what see on the photos. Condition: new. SPECIAL CANCELLATION - Seals of the Cossack Age 75 years of UPA organization - the Ukrainian Insurgent Army. UKRAINE 2017. FDC, FD Covers. The set includes 14.10 -75 years of UPA organization - the Ukrainian Insurgent Army. Ukraine 2018. Also note that monitor settings may vary from computer to computer and may distort actual colors. SPECIAL CANCELLATION - 12.11.2018. All photos are actual, so you buy what see on the photos. NEW YEAR.". The set includes Also note that monitor settings may vary from computer to computer and may distort actual colors. All photos are actual, so you buy what see on the photos. The item should be in its original condition. SPECIAL CANCELLATION - 26.05.2018. Also note that monitor settings may vary from computer to computer and may distort actual colors. All photos are actual, so you buy what see on the photos. The set includes. The Fight Under the Kruty.100 Years ". January 29, 2018 a special Cancellation was held: "29.01.2018. 01001, Kiev. ". Also note that monitor settings may vary from computer to computer and may distort actual colors. 100 Years. January 29, 2018 a special Cancellation was held: "29.01.2018. 01001, Kiev. ". Also note that monitor settings may vary from computer to computer and may distort actual colors. We believe that everything could be solved by communication. The Fight Under the Kruty.100 Years " is put into circulation. January 29, 2018 a special Cancellation was held: "29.01.2018. 01001, Kiev. ". Also note that monitor settings may vary from computer to computer and may distort actual colors. Soviet School, Children. Also note that monitor settings may vary from computer to computer and may distort actual colors. The set includes Date of issue 01.09.1960. All photos are actual, so you buy what see on the photos. Special cancellation -" 100th ANNIVERSARY OF THE STATE SERVICE OF UKRAINE ", 21.09.2018, ODESSA. Also note that monitor settings may vary from computer to computer and may distort actual colors. The set includes. FD COVER: Oleksandr (Oles) Honchar, 100 years from birth. Also note that monitor settings may vary from computer to computer and may distort actual colors. The format of the cover – 115х162 mm. The set includes. CHILDREN'S DRAWING COMPETITION : "UKRAINE IS A FOOTBALL COUNTRY.". The set includes Also note that monitor settings may vary from computer to computer and may distort actual colors. All photos are actual, so you buy what see on the photos. KIROVOGRAD: " ROSE. The set includes Also note that monitor settings may vary from computer to computer and may distort actual colors. All photos are actual, so you buy what see on the photos. The item should be in its original condition. Photo - Vladimir Romanenko, a defender of the National team of Ukraine on hockey. Also note that monitor settings may vary from computer to computer and may distort actual colors. The set includes. People's artist of USSR (1964). The winner of the Stalin prize, first degree (1952). The set includes Also note that monitor settings may vary from computer to computer and may distort actual colors. UKRAINE 2017. SPECIAL CANCELLATION - 07. 12.2017. Also note that monitor settings may vary from computer to computer and may distort actual colors. Size of the COVER: 11x22 sm. The set includes The item should be in its original condition. Special cancellation - the city of Odessa. Тhe set includes Also note that monitor settings may vary from computer to computer and may distort actual colors. All photos are actual, so you buy what see on the photos. Size 11,5 x 16 sm. Тhe set includes Special cancellation - the city of KIEV. Also note that monitor settings may vary from computer to computer and may distort actual colors. All photos are actual, so you buy what see on the photos. He is best known as the leader of the Organization of Ukrainian Nationalists between 1929 and 1938. Also note that monitor settings may vary from computer to computer and may distort actual colors. The set includes. UKRAINE 2017. SPECIAL CANCELLATION - 07. 12.2017. Also note that monitor settings may vary from computer to computer and may distort actual colors. Size of the COVER: 11,5x16 sm. The set includes The item should be in its original condition. PRAGUE - KIEV. The format of the cover – 115х162 mm. SPECIAL CANCELLATION - 31.03.2018. The set includes Also note that monitor settings may vary from computer to computer and may distort actual colors. SPECIAL CANCELLATION “125 YEARS TO THE KIEV ELECTRIC TRAM”- 17.06.2017. The format of the cover – 163х105 mm. The set includes Also note that monitor settings may vary from computer to computer and may distort actual colors. Avec charnière et 3 timbres avec des rousseurs sur les dents. Ukraine, 1993 issue. Scouting Postal Card. First Day Canceled.